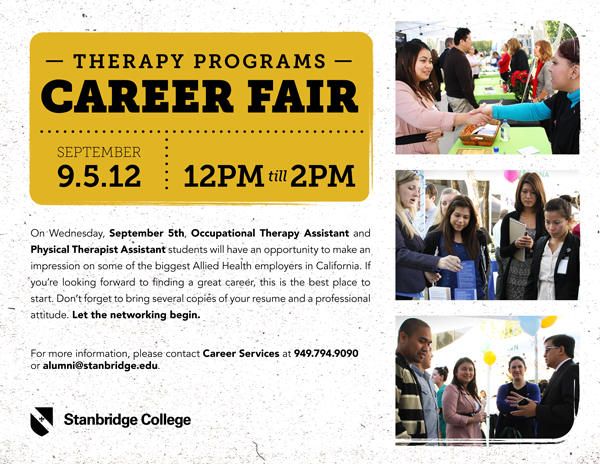 Stanbridge College is pleased to announce its Fall 2012 Therapy Programs Career Fair on Wednesday, September 5, 2012. Stanbridge College’s Occupational Therapy Assistant and Physical Therapist Assistant students will be able to network with Allied Health employers from Southern California. Attendees will meet potential employers, explore new career opportunities and gather advice on what skills and qualities employers are looking for in future employees. For more information on Stanbridge College Career Services please visit www.stanbridge.edu.